San Francisco is a wonderful city to explore on foot. Although walking through our streets can be hectic and dangerous. 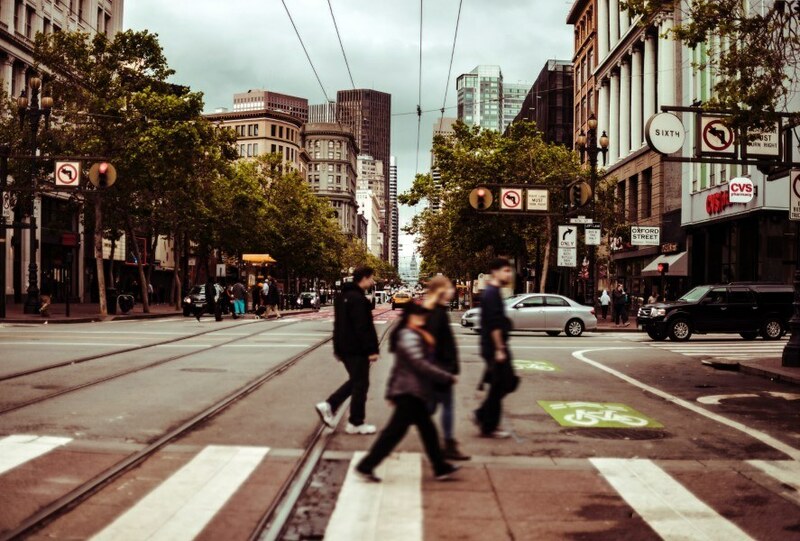 I know this first-hand from my work as one of San Francisco’s top pedestrian accident attorneys, but there are some great walking options that don’t involve the stress of heavy traffic. You can spend days finding hidden gems in welcoming neighborhoods like Lower Haight or The Mission. But with the perfect balance between urban and natural beauty it’s easy to find daytrip hikes that will take you to breathtaking overlooks without straying too far from the city’s center. And it’s important to keep in mind there’s definitely more to look at than the Golden Gate Bridge. Native or tourist you’re bound to find your favorite new trail on the list of top 7 urban hikes in San Francisco. This is the tallest of San Francisco’s famous hills but it’s not so tall that you’ll poop yourself out trying to get to the peak. At just 0.44 miles from the foot to the tip, it’s a short (though demanding) urban hike that will leave you with a breathtaking view of downtown. This historic San Francisco landmark encompasses over 25 miles of hiking trails so adventurers of all stripes can explore for days. But one of the best is the Promenade trail. The 2.2 mile stretch will afford hikers gorgeous views of San Francisco Bay. It begins at the Lombard Gate and ends at the Golden Gate Bridge so it’s perfect for tourists who want the authentic San Francisco experience. This short trail is less than three-quarters of a mile long but there’s plenty of elevation to give you a workout. More leisurely hikers will love the extreme views of rocky cliffs dropping into San Francisco Bay, the Golden Gate Bridge, and Marin in the distance. Plus there’s a little history along this urban hike. You can stop off at each of the gun batteries along the way and glean a little bit of what life was like back in World War II when the threat of Japanese invasion was very real on the West Coast. This is one of my favorites, as I live really close by. These rugged steps offer a great workout right in the heart of the action. Located between The Presidio and Pacific Heights they offer a few nice views of San Francisco Bay but you’ll likely be too focused on putting one foot in front of the other to notice—at least until you get to the top. This run makes an excellent mid-day lunchbreak workout. This mostly flat trail is nearly all paved and offers an idyllic woodland setting for those who want to forget they’re just minutes away from the heart of San Francisco. The whole loop around the lake is over four miles and is easily traversable for older individuals and children. Take it in slow segments with a picnic lunch between or do the whole thing in one shot in about an hour. This network of trails is excellent for dog owners because their canine pals are allowed of the leash most of the way. You could spend a half hour here or the entire day and still never get bored because there are so many crisscrossing trails. Keep in mind that the whole thing is sand (except for portions Sand Ladder Trail) so it might not be the best for individuals who have difficulty with uneven surfaces. Part of Golden Gate Park, you have to cross one of the foot bridges over Stow Lake to get to Strawberry Hill. Once on the small island you can choose a variety of hiking paths including a circular route to the top that is just under 2 miles long. Along the way you’ll be afforded some unique views of the water as well as gorgeous flowering shrubs up and down the hill. When you reach the peak you’ll be able to gaze out over the bay to the Marin Headlands. Here in San Francisco we encourage people to get out and see the city first-hand but unlike other major urban areas in The United States, there are plenty of opportunities to take in the natural beauty of the California coast. Within minutes you can transport yourself from the hustle and bustle of Market Street to the isolated wonder of Golden Gate Park or the rugged coast of the San Francisco Bay. San Francisco may have been voted one of the most walkable cities in the world but it’s also one of the most hikable too. Where will your next urban adventure take you? Sadly, accidents happen in San Francisco. If you or someone you love has been hit by a car in San Francisco and suffered serious injuries, get a FREE case evaluation to see if we can help.